Shivarathreeshwara Centre and Sri Shivarathri Rajendra Chinthana Mantap, located in JSS Educational Campus, Jayanagar, Bengaluru, and Sri Ganalinga Shivayogi Sabha Bhavan, located in the premises of JSS Public School, Banashankari 2nd Stage, Bengaluru, are three state-of-the-art auditoriums situated in the heart of Bangalore. 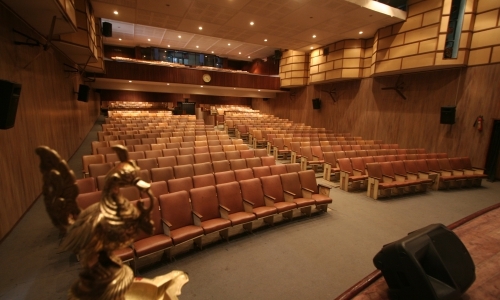 Both are well-equipped with modern lighting, sound system and comfortable seats, and are dedicated for promoting cultural and literary activities. Sri Shivarathreeshwara Kalamantapa was started with the blessings of Dr Sri Shivarathri Rajendra Mahaswamiji in 1948. Its purpose was to stage dramas based on the life stories of spiritual personalities and to propagate their messages and change the attitude of people. This Kalamantapa has helped several dramatists and playwrights achieve fame. 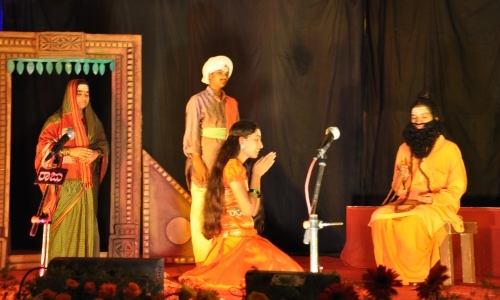 Of the several plays staged by the Kalamantapa, some of the popular ones are Adarsha Vivaha, Shri Paadake Namo Namaha, Sri Shivarthreeshwara Vijaya, Jagajyothi Basaveshwara and Nijaguna Shivayogi. The Kala Mantapa has a tradition of honouring senior artistes every year. The plays of Kalamantapa have been selected for national (Delhi) and international (Nepal) festivals. 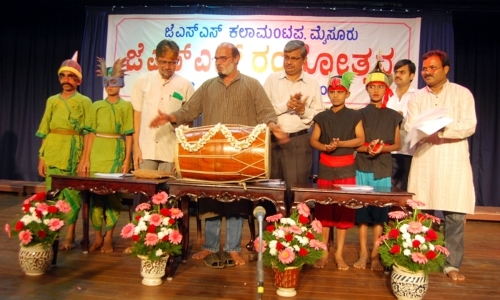 The Kala Mantapa organises JSS Rangotsava every year in Mysuru. Plays relevant to today’s social and cultural context are staged during this theatre festival. The Kala Mantapa organizes JSS Rangotsava every year in Mysuru. Plays relevant to today’s social and cultural context are stage during this theatre festival. This forum was started in 2005, at the JSS Educational Institutions campus, in Jayanagar, Bengaluru. In this forum, 96 cultural programmes were held during the year including the programmes organized by the All India Sharana Sahitya Parishath and JSS schools and colleges. 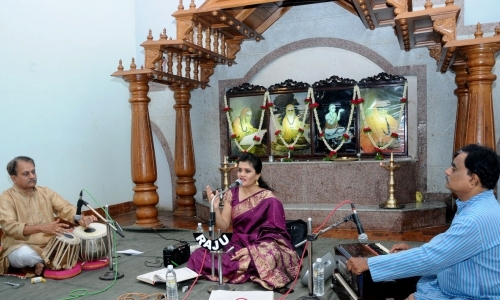 The JSS Sangeetha Sabha Trust has been founded to popularise and encourage classical music. Hitherto more than five hundred concerts have been organised in which artists of national and international fame have participated. Apart from helping local artists, budding and upcoming artists are also being encouraged. For this purpose, the Sabha has started a separate youth wing. The Sabha organises music appreciation workshops and music competitions to help youngsters develop aptitude and love towards classical Carnatic music. 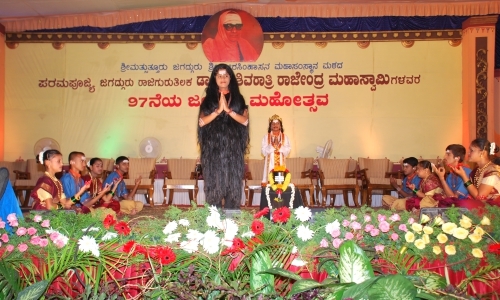 Sangeetha Sammelana is organised every year in December in connection with the commemoration of Dr Shivarathri Rajendra Mahaswamiji’s Jayanthi. During Shravana Masa, special poojas, discourses, essay-writing competition for listeners of discourses are held in Mysuru and Suttur for one month. ‘Shivanubhava Dasoha’ programme was started in 1996 to regularly hold spiritual discourses under the aegis of Sri Shivarathreeshwara Dharmika Datti. This programme has earned much appreciation. Held on the last Saturday of every month, discourses are given on religion, life, etc. So far, more than 200 discourses under ‘Shivanubhava Dasoha’ programme have been delivered. The Moonlight Music programme, organised on every full-moon day, recently crossed a significant milestone of conducting 200 programmes.